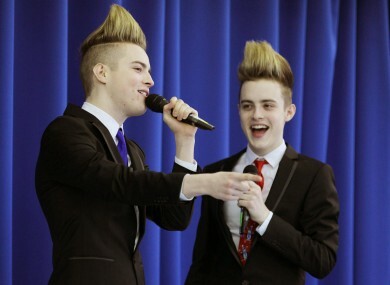 LUCAN TWINS JEDWARD are to be one of the five acts shortlisted to represent Ireland at the 2011 European Song Contest, according to reports today. Eurovision news blog ESCdaily.com yesterday reported that the former X Factor twins – who topped the Irish charts this time last year with ‘Under Pressure (Ice Ice Baby)’ – had been confirmed as one of the five acts that will participate in Ireland’s national final. Today’s Irish Daily Star confirms the inclusion of Jedward among the shortlist, saying that the madcap 19-year-olds are to feature on the Late Late Show on February 11, when Ireland’s participant will be chosen. Among the other acts suggested by both sources are Nikki Kavanagh, a church singer who sang as a backing singer for Niamh Kavanagh in last year’s contest in Oslo, and singers the Vard Sisters, who came second in the Irish final in 1998 to Dawn Martin. The other two acts are Limerick musician Don Mescall, who featured in the 2006 Irish shortlist and has written songs for Ronan Keating and the Backstreet Boys, and an as-yet-unnamed pop band currently being assembled by MCD, which the Star suggests do not have any Eurosong experience. RTÉ announced in November that it was dispensing with the traditional public entry system, and had instead invited five ‘mentors’ from the music business to submit one act each. Those acts included MCD director Caroline Downey-Desmond, EMI chairman Willie Kavanagh, ‘Lord of the Dance’ composer Ronan Hardiman and musical director David Hayes. The final of this year’s Eurovision takes place in Düsseldorf, Germany on May 14, with the two semi-finals on May 10 and 12. Email “Jedward among five acts shortlisted for Eurovision”. Feedback on “Jedward among five acts shortlisted for Eurovision”.